dacadoo and Loylogic Inc., the global leader in e-commerce and e-payment solutions for loyalty programs, announce a global strategic partnership. The Swiss company dacadoo ag develops and operates a digital, mobile health engagement platform that helps employees actively manage their health in an easy and fun way. To engage users to remain active and healthy, the company applies motivational techniques from online games, collaborative features from social networks, personalized feedback and the patented dacadoo Health Score to better understand and improve their health. Loylogic designs and builds e-commerce and e-payment solutions for loyalty programs globally across different industries, whose powerful solutions amplify engagement and build customer loyalty. As an award winning industry innovator and creator of ‘points experiences’, insights, commerce and engagement, Loylogic thrives to make loyalty programs more impactful by making their points loved more. Both companies announce today that they have signed a global strategic partnership whereby dacadoo will integrate Loylogic’s rewards solution into its digital and mobile health engagement platform to offer a seamless end-to-end user experience to its health and life insurance clients around the world. Through this partnership dacadoo’s health engagement platform will offer a world class rewards shop to further motivate its users to engage in healthy lifestyle activities over a long period of time. Health and Life Insurance operators and other enterprise customers who offer the dacadoo platform to their end users can now activate this feature to allow users to earn points for engaging in healthy activities, browse the extensive rewards catalogue, and automatically fulfill their rewards choices by redeeming their points. Loylogic is the world’s leading innovator and creator of points experiences, insights, commerce and engagement. By tantalizing members with more choices and arming programs with insights on behavior – anticipating both present and future needs – we deliver powerful solutions that amplify engagement and build loyalty. Founded in 2005 with offices around the world and a global content network of more than 500 merchants and 2,000 online stores offering millions products and services, Loylogic, the new paradigm of points-based e-commerce and e-payment solutions, is the partner that the world’s leading loyalty programs trust with making their points and miles loved more. For more information, please visit loylogic.com. dacadoo is a global technology company and innovative business partner that is driving the digital transformation in healthcare. 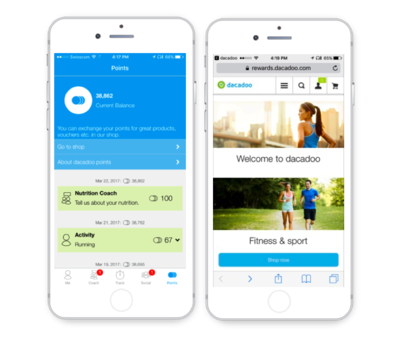 Based in Zurich, Switzerland, dacadoo strengthens health and wellbeing through active engagement and artificial intelligence. dacadoo develops and operates a mobile-first digital health engagement platform that helps people live healthier, more active lives through a combination of motivational techniques from behavioral science, online gaming and social networks, as well as artificial intelligence and automated coaching. Based on over 200 million person-years of clinical data, its patented, real-time Health Score makes health individually measurable, which provides users with a unique engagement experience, while also offering dacadoo’s enterprise customers an effective way to measure the true health impact of wellness programs. Available in over 10 languages, dacadoo’s technology is provided as a fully branded, white-label solution or it can be integrated into customer products through its API. dacadoo's customers include health and life insurance companies, health & wellness service organizations as well as large and mid-sized employers for health promotion in the workplace. For more information visit www.dacadoo.com.